I love the quarterly Dev days that SCIO puts on – an opportunity to sit down with like-minded folks and talk about the world through various systems lenses. One of the situations we explored at the last Dev day was the collapse of Carillion, and our group chose to look at it through the lens of fitness landscapes, particularly “basins of stability”. A couple of us drew the landscape out on a whiteboard as the conversation progressed … I forgot to take a photo, so I’ve re-made it as you can see below. What I want to draw attention to is the interplay between metaphors and stories that happens when you start drawing things on whiteboards instead of just listing bullet points. When all you use are words (particularly big words, like “fitness landscape”, “homeostasis”, “autopoiesis” …) the implicit metaphors tend to stay implicit. People nod their heads, assume because we’re using the same words they must mean the same thing, and the conversation drifts on. Once you draw out what people are saying the implicit metaphors become explicit. Although some interpretations are excluded (so no, a “basin of stability” is not a washing up bowl cemented to a floor), the richness that remains has the virtue of shared meaning. The potentialities of the metaphor that emerge draw people along rather than excluding them – altitude is value, gravity is entropy, stability is a function of the depth and width of the basin combined with the resilience of the edges to withstand external pressure. You don’t need to figure these things out in your head, because you can see them right in front of you. So people stop being penalised if they haven’t read those books or heard those words. Once everyone is working off a shared mental schema, you then get stories and creative adaptations of the base metaphor. 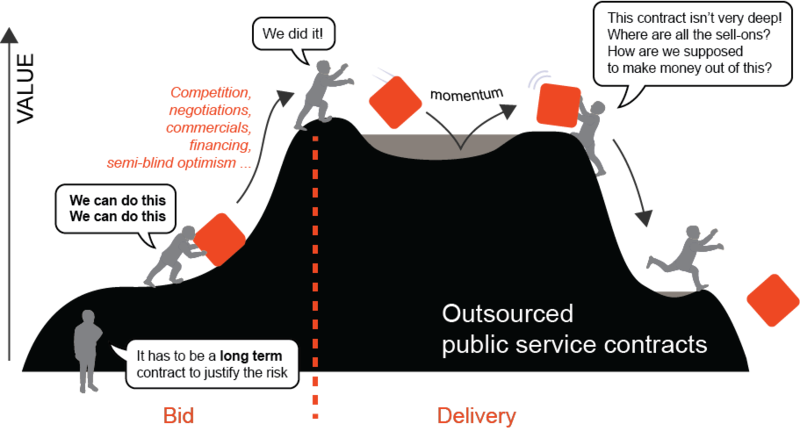 In our group someone talked about how the hard graft, determination and force of sheer optimism required to get an outsourcing contract up and over the hill creates the momentum that seeds its own destruction. I’ve drawn this in above, but it wasn’t part of the original scribble. It’s an example of creative sensemaking. Someone else described how although we force ourselves to believe the basin is deep on the way up (“lots of sell-on potential here”), it turns out to have been filled in by the time we get there. Someone else contrasted the huge challenge of climbing an old and relatively stable hill in the face of overwhelming competition with the luxury of being there while the hills are being formed around you. The point is not that these insights are the only, the best, or even the most accurate ways of seeing the situation. The “basins of stability” metaphor was just one of several possible lenses. The point is that groups sensemaking requires things to make sense. If all language is metaphorical (which I think it is) then it can be drawn, and the drawings will be closer to sense-experience (“iconic”, as Peirce would have said) than the words.